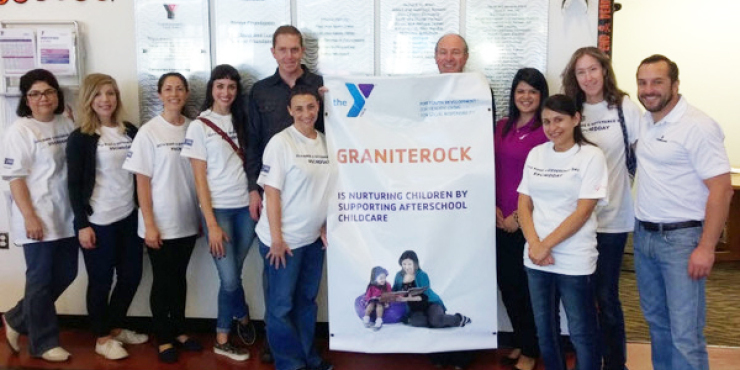 Graniterock was thrilled to team up with United Way of Santa Cruz County for this year's "Make a Difference Day" Oct. 24-25. This event mobilizes our community and local businesses to make a difference in Santa Cruz County, uniting in a common mission to help others through volunteer projects. Ann Giusiana, Cecilia Dodson, Kevin Jeffery, Keith Severson, Aaron Johnston, Jana Monello, Stephanie Kniffin, Stephanie Rodriguez, Diana Villegas and Janae Thomas were happy to spend a few hours sweeping, scrubbing and polishing up the Watsonville Family YMCA. This event is a great opportunity for local nonprofit organizations to host a project that benefits their organization, tell their story and introduce new people to their cause.